Modern neuroscientists have proposed that the definition of stress could be restricted to conditions in which the environmental demand exceeds an individual’s natural regulatory or adaptive capacity.4 This can be acute or chronic. In acute stress, there is a sudden, unexpected environmental change. In chronic stress, there is a constant low-level stressor present that prevents regulation or adaptation. Both can go on for hours, days, weeks, or years, and both can have multiple physical or psychologic effects (eg, chronic pain, insomnia, depression, or anxiety). The common element between both acute and chronic stress is cortisol elevation. In acute stress, cortisol rises to a peak and then returns to the previous baseline. In chronic stress, cortisol rises and then remains at an elevated baseline. Figure 1. 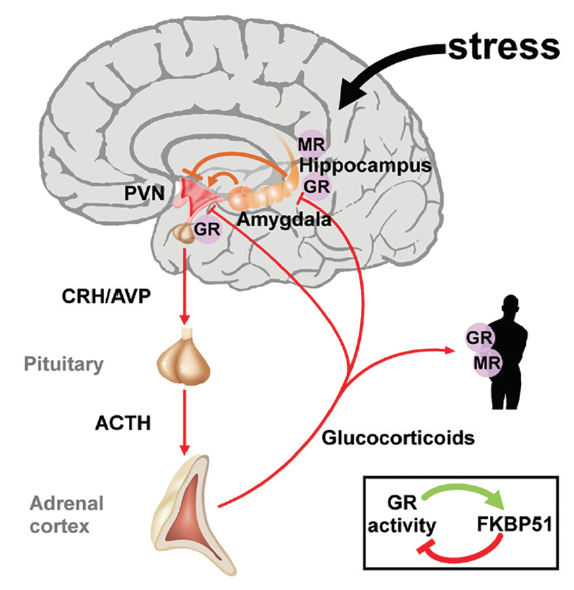 The hypothalamic-pituitary-adrenal axis integrates and mediates the stress response. ACTH, adrenocortiotrophin; AVP, arginine vasopressin; CRH, corticotrophin-releasing hormone; GR, glucocorticoid; MR, mineralocorticoid; PVN, paraventricular nucleus. Reproduced with permission from Raabe FJ, Spengler D. Epigenetic risk factors in PTSD and depression. Front Psychiatr. 2013;4:80. doi: 10.3389/ fpsyt.2013.00080 under Creative Commons Attribution License 3.0. The physiologic response to stress begins in the parvocellular neurons of the paraventricular nucleus that secrete corticotrophin-releasing hormone (CRH) and arginine vasopressin (AVP), which induce release of pro-opiomelanocortin (POMC) by the anterior pituitary gland (Figure 1). Metabolism of POMC breaks it down into adrenocorticotrophin (ACTH), opioid peptides, melanocortin, and other peptides. At the adrenal cortex, ACTH stimulates cortisol release. Cortisol, in turn, activates glucocorticoid (GR) and mineralocorticoid (MR) receptors coexpressed in limbic structures. At the hippocampus and amygdala, cortisol metabolites affects GABAA receptors and feed signals forward to the prefrontal cortex where there are inhibitory and excitatory effects of cortisol. There is a commonly held belief that increasing stress increases seizures; however, that is difficult to prove because there are so many factors that may induce or precipitate seizures. In our clinic, when a patient calls in saying that they’ve had breakthrough seizures, we have a series of questions that we ask. These questions include whether the patient has been drinking or has been ill, what medications they’ve taken or missed, what stage of the menstrual cycle female patients are in, and other well-defined stressors (eg, new home, job loss, or changes in family circumstances). For many patients, we find that there has been a chronic level of stress in the patient’s life and an additional stressor, such as an infection, tipped the balance. Despite asking all these questions, not everyone responds to stressors in the same way. For example, the loss of a pet may be stressful enough to cause a breakthrough seizure in some patients but not in others. This is where the art of medicine comes in and we have to evaluate our patients as individuals. In a classic study from 1959, patients with epilepsy were asked sexually explicit questions or whether they were lying about something while they were having an EEG performed; 30% had increased interictal findings on their EEG that were not seen in control subjects without epilepsy.5 In another study in 1969, people who did not have epilepsy and were asked similar stressful questions did have EEG-tracing changes including narrowing of bandwidth and regional changes in frequency.6 In this study, blinded reviewers had a 98% intrareviewer accuracy in identifying these changes. A later study of self-reported stress correlated stress with a 58% increase in seizure activity in patients who were closely observed in a group home setting.7 Seizure frequency is known to go up in war zones.8,9 After a natural disaster, patients with epilepsy had increases in seizure frequency and rate of de novo diagnosis of epilepsy increased as well.10 These studies together suggest that there are changes in neuroelectric activity in response to stress. Clinical Trials. Observations in animal models have led to clinical trials of glucocorticoid antagonists. Mifepristone was studied for the treatment of anxiety and depression and failed because of side effects of immunosuppression and a compensatory surge in endogenous ACTH and cortisol that led to adrenal insufficiency.25,26 Another study in which corticotropin-releasing factor (CRF) receptors were blocked, animal anxiety- and depression-like behavior and addiction were reduced; in humans, side effects were large and there was no efficacy of the treatment for anxiety, depression, or posttraumatic stress disorder.27,28 In all of these studies, cortisol was given throughout the day and it may be that the timing of treatment is important. Catamenial seizures are a unique stress in epilepsy. The menstrual cycle is a physiologic stress because it results in homeostasis changing over a 28-day cycle. Estrogen promotes seizure activity and progesterone decreases seizure activity. Figure 2. The relationship between seizure frequency and estradiol and progesterone levels. Reproduced with permission from Reddy DS. Catamenial epilepsy: discovery of an extrasynaptic molecular mechanism for targeted therapy. Front Cell Neurosci. 2016;10:101. doi: 10.3389/fncel.2016.00101 through the Creative Commons Attribution license 3.0. 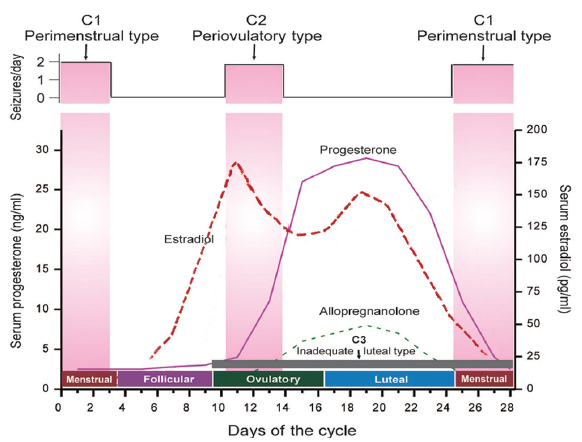 There are several hormone peaks over the course of the menstrual cycle. Estrogen peaks just prior to ovulation, when seizures are most frequent, then drops to a plateau at a level above the preovulation baseline. Estrogen levels then increase slightly and gradually through the end of the cycle when there is a rapid withdrawal of both estrogen and progesterone. The rapid withdrawal of progesterone at the end of the menstrual cycle is thought to be the cause of the second peak in seizure activity (Figure 2).37 In animal models, synaptic density in the hippocampus increases during the physiologic estrous cycle and there is better performance on memory tasks when estrogen is at its peak. It may be that the increase in synapses causes increased excitatory activity and thereby more seizures. Withdrawal of allopregnanolone—when progesterone levels drop rapidly—reduces the allosteric stabilization of GABAA receptors, weakening inhibitory signaling, which may explain the second peak in seizure activity at that time. Hippocampal anatomy can be assessed on traditional MRI, especially higher field studies, but microanatomic changes in synapses cannot be resolved. A new technique called magnetic resonance elastography (MRE) uses shear waves to measure brain tissue shear stiffness and damping ratio to create a unique visualization of hippocampal structural properties.38 In an early study, we have found a strong correlation between damping ratio (ie, a measure of how viscous a tissue behaves or how well it absorbs wave energy) and performance on a relational memory task in healthy young adult men (n = 20)39 and in a larger study including men and women (n = 51).40 Lower hippocampal damping ratio, indicating a less viscous and more elastic tissue, correlates with better performance on memory tasks. This allows MRE to be used for analysis of microanatomy that correlates very significantly with function. We hypothesize that changes in synaptic density may affect the structural properties of hippocampal tissue and are conducting preliminary research using MRE in patients with mesial temporal sclerosis and in normal healthy female volunteers to observe how the structure changes over the course of a normal menstrual cycle (physiologic stress). The MRE technique promises to be an informative and useful addition to imaging for understanding pathophysiology as well as normal physiology of many conditions. The neurochemistry of stress and the studies discussed make a strong case that reducing chronic stress can be beneficial for our patients, although as yet there is no easy way to do that. Studies and experience suggest several methods we can recommend to our patients (Box). Among the most effective methods of stress reduction is to remove, escape, or avoid the stressor. In practice, this means taking yourself out of a stressful situation, which is not always possible. In this case, it can be very effective to change your perspective on the stressor, and counseling and cognitive behavioral therapy can help people achieve this. Exercise is essential to recommend to patients even if they are able to do only 10 minutes of mild exercise while seated. Exercise decreases stress, improves sleep, increases vascularization (which in patients with epilepsy has an antiseizure effect), supports hippocampal health, and improves memory.41, 42 Relaxation techniques that help people achieve a meditative state are also shown to decrease stress and a wide variety of activities are useful from yoga to knitting or walking. Although counterintuitive because it means taking on more responsibility and more work, volunteering to help others can also reduce stress. This may be because it is a way of achieving the first 2 recommendations: allowing people to stop thinking about their own stressors (removal) or changing their perspective on their stressors. Stress is difficult to measure objectively and difficult to study because of obvious ethical issues of inducing stress in study subjects. Cortisol levels correlate with quantifiable acute and chronic stress in animal models, with acute stress reducing seizure activity and chronic stress increasing seizure activity. In humans, stressful situations (eg, war, natural disasters) and cortisol levels correlate with seizure activity. In women, progesterone, which has a similar effect in the hippocampus as cortisol, and estrogen also correlate with seizure activity. 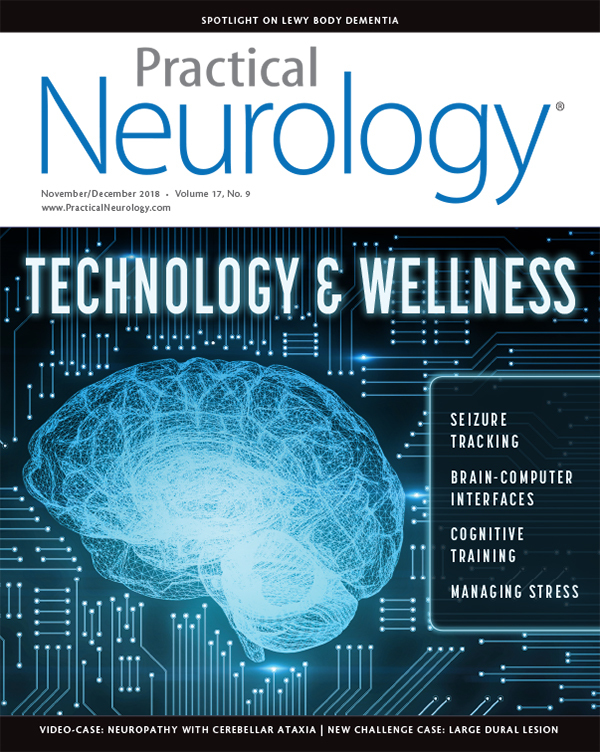 Together, these studies support the observation that stress increases seizures and that it is important to help patients manage stress as part of managing seizures. 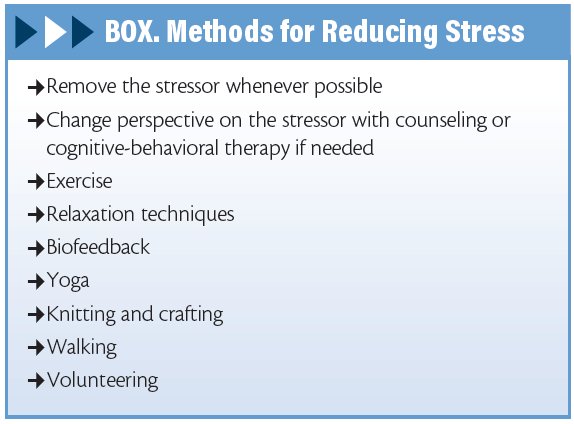 Studies and experience show that removing or adjusting to stressors, exercise, meditative activities and biofeedback, and social interaction may all be beneficial in this regard. 1. Hooke R. De Potentia Restitutiva, or of Spring. Explaining the Power of Springing Bodies, London, 1678. 2. Cannon WB. Physiological Regulation of Normal States: Some Tentative Postulates Concerning Biological Homeostatics. Paris, France: Editions Medicales;1926. 3. Selye H. A syndrome produced by diverse nocuous agents. Nature. 1936;138:32. 4. McEwen BS, McEwen CA. Response to Jerome Kagan’s Essay on Stress. Perspect Psychol Sci. 2016;11(4):451-455. 5. Stevens JF. Emotional activation of the electroencephalogram in patients with convulsive disorders. J Nerv Ment Dis. 1959 Apr;128(4):339-351. 6. Berkhout J, Walter DO, Adey WR. Alterations of the human electroencephalogram induced by stressful verbal activity. Electroencephalogr Clin Neurophysiol. 1969 Nov;27(5):457-469. 7. Temkin NR, Davis GR. Stress as a risk factor for seizures among adults with epilepsy. Epilepsia. 1984;25:450-456. 9. Neufeld MY, Sadeh M, Cohn DF, Korczyn AD. Stress and epilepsy: the Gulf War experience. Seizure. 1994;3:135-139. 10. Swinkels WA, Engelsman M, Kasteleijn-Nolst Trenité DG. Influence of an evacuation in February 1995 in The Netherlands on the seizure frequency in patients with epilepsy: a controlled study. Epilepsia. 1998;39:1203-1207. 11. Culebras A, Miller M, Bertram L, Koch J. Differential response of growth hormone, cortisol, and prolactin to seizures and to stress. Epilepsia. 1987;28:564-570. 12. Abbott RJ, Browning MC, Davidson DL, et al. Serum prolactin and cortisol concentrations after grand mal seizures. J Neurol Neurosurg Psychiatry. 1980;43:163-167. 13. Pritchard PB 3rd, Wannamaker BB, Sagel J, Daniel CM. Serum prolactin and cortisol levels in evaluation of pseudoepileptic seizures. Ann Neurol. 1985;18:87-89. 14. Aitouche Y, Gibbs Sa, Gilbert G, et al. Proton MR spectroscopy in patients with nonlesional insular cortex epilepsy confirmed by invasive EEG recordings. Epilepsia. 2005;46:517-523. 15. Reddy DS. Is there a physiological role for the neurosteroid THDOC in stress-sensitive conditions? Trends Pharmacol Sci. 2003;24:103-106. 16. Taylor KC, Sanders CR. Regulation of KCNQ/Kv7 family voltage-gated K+ channels by lipids. Epilepsia. 2009;50:586-597. 17. Karst H, Joëls M. Corticosterone slowly enhances miniature excitatory postsynaptic current amplitude in mice CA1 hippocampal cells. Neurophysiol. 2005:94; 3479-3486. 18. Kole MH, Swan L, Fuchs E. The antidepressant tianeptine persistently modulates glutamate receptor currents of the hippocampal CA3 commissural associational synapse in chronically stressed rats. Eur J Neurosci. 2002;16:807-816. 19. Okuhara DY, Beck SG. Corticosteroids influence the action potential firing pattern of hippocampal subfield CA3 pyramidal cells. Neuroendocrinol. 1998;67:58-66. 20. Sapolsky RM, Krey LC, McEwen BS. Prolonged glucocorticoid exposure reduces hippocampal neuron number: implications for aging. J Neurosci. 1985;5:1222-1227. 21. Stein-Behrens B, Mattson MP, Chang I, Yeh M, Sapolsky R. Stress exacerbates neuron loss and cytoskeletal pathology in the hippocampus. J Neurosci. 1994;14:5373-5380. 22. Conforti N, Feldman S. Effect of cortisol on the excitability of limbic structures of the brain in freely moving rats. J Neurol Sci. 1975;26:29-38. 23. Schridde U, van Luijtelaar G. Corticosterone increases spike-wave discharges in a dose- and time-dependent manner in WAG/Rij rats. Pharmacol Biochem Behav. 2004;78:369-375. 24. Maguire J, Salpekar JA. Stress, seizures, and hypothalamic-pituitary-adrenal axis targets for the treatment of epilepsy. Epilepsy & Behavior. (26) 2013 352-362. 25. Laue L, Lotze MT, Chrousos GP, et al. Effect of chronic treatment with the glucocorticoid antagonist RU 486 in man: toxicity, immunological, and hormonal aspects. J Clin Endocrinol Metab. 1990;71:1474-1480. 26. Nihalani ND, Schwartz TL. Mifepristone, a glucocorticoid antagonist for the potential treatment of psychotic major depression. Curr Opin Investig Drugs. 2007;8:563-569. 27. Koob GF, Zorrilla EP. Update on corticotropin-releasing factor pharmacotherapy for psychiatric disorders: a revisionist view. Neuropsychopharmacology. 2012;37: 308-309. 28. Dunlop BW, Binder EB, Iosifescu D,et al. Corticotropin-releasing factor receptor 1 antagonism is ineffective for women with posttraumatic stress disorder. Biol Psychiatry. 2017 Dec 15;82(12):866-874. 29. Rivera C, Voipio J, Payne JA, et al. The K+/Cl- co-transporter KCC2 renders GABA hyperpolarizing during neuronal maturation. Nature 1999;397:251-255. 30. Payne JA, Rivera C, Voipio J, Kaila K. Cation-chloride co-transporters in neuronal communication, development and trauma. Trends Neurosci. 2003;26:199-206. 31. Rivera C1, Voipio J, Kaila K. Two developmental switches in GABAergic signalling: the K+-Cl- cotransporter KCC2 and carbonic anhydrase CAVII. J Physiol. 2005;562:27-36. 32. Carter BM, Sullivan BJ, Landers JR, and Kadem, SD. Dose-dependent reversal of KCC2 hypofunction and phenobarbital-resistant neonatal seizures by ANA12. Sci Rep. 2018;8:11987. 33. Gutschmidt KU, Stenkamp K, Buchheim K, Heinemann U, Meierkord H. Anticonvulsant actions of furosemide in vitro. Neuroscience 1999;91:1471-1481. 34. Hannaert P, Alvarez-Guerra M, Pirot D, Nazaret C, Garay R. Rat NKCC2/NKCC1 cotransporter selectivity for loop diuretic drugs. Arch Pharmacol. 2002;365:193-199. 35. Kahle KT, Barnett SM, Sassower KC, Staley KJ. Decreased seizure activity in a human neonate treated with bumetanide, an inhibitor of the Na(+)-K(+)-2Cl(-) cotransporter NKCC1. J Child Neurol. 2009;24:572-576. 36. Dzhala VI, Brumback AC, Staley KJ. Bumetanide enhances phenobarbital efficacy in a neonatal seizure model. Ann Neurol. 2008;63(2):222-235. 37. Herzog AG, Klein P, Ransil BJ. Three patterns of catamenial epilepsy. Epilepsia. 1997;38(10):1082-1088. 38. Johnson CL, Schwarb H, D J McGarry M, et al. Viscoelasticity of subcortical gray matter structures. Hum Brain Mapp. 2016;37(12):4221-4233. 39 Horecka KM, Dulas MR, Schwarb H, et al. Reconstructing relational information. Hippocampus. 2018 Feb;28(2):164-177. 40. Schwarb H, Johnson CL, McGarry MDJ, Cohen NJ. Medial temporal lobe viscoelasticity and relational memory performance. Neuroimage. 2016;132:534-541. 41. Liu-Ambrose T, Donaldson, M Exercise and cognition in older adults: is there a role for resistance training programmes? Br J Sports Med. 2009;43(1):25-27. 42. Bherer L, Erickson KI, Liu-Ambrose T. A review of the effects of physical activity and exercise on cognitive and brain functions in older adults. J Aging Res. 2013;2013:657508. GRH has received research funding from Eisai Pharmaceuticals and serves as an advisor to Eisai Pharmaceuticals and Sage Pharmaceuticals.